Living Room Drapes Puddled - Sew What? Sew Anything! - Sew What? Sew Anything! Great fabric brings these drapes from great to grand. My client has a fabulous house and it has been a great pleasure to help her with many projects. These drapes were so fun to make because the fabric was simply gorgeous. When the drapes were hung it reminded us both of the train of a wedding dress. 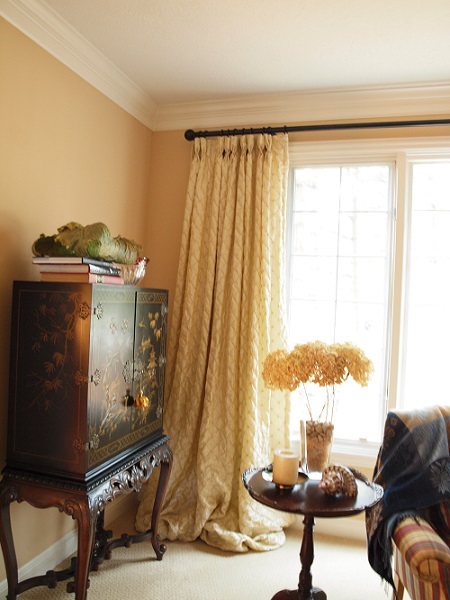 The J. Ennis Curtain rod has helped stabilize the drapes on the large windows. These drapes are able to pull along so that they are easily able to cover the whole window when needed.